, but who Latinized his name into Flaccus Illyricus, because a native of Albona or Albana in Illyria, was born March 3, 1520. He was instructed in grammar and the classics b.y Egnatius at Venice, and gave the preference to divinity as a profession. Not being able, however, to maintain the cxpences of university education, he intended to throw himself into a monastery, but happening to consult with a relation of his mother’s, who was provincial of the | Cordeiiers, and who had begun to see through the errors of popery, this person prevailed with Flacius to lay aside all thoughts of the monastic life, and go into Germany, where his knowledge of Greek and Hebrew would procure him a maintenance until he had completed his theological studies. Flacius accordingly took this advice, went to Basil in 1539, and, after a few months stay, went to Tubingen, where he remained until 1541, and theft removed to Wittenberg, to complete his studies under Luther and Melancthon, the latter of whom found him some employment in the university, and was the means of relieving his mind from anxious doubts respecting some of the fundamental principles of the reformed religion, respecting the nature of sin, the wrath of God, and predestination. 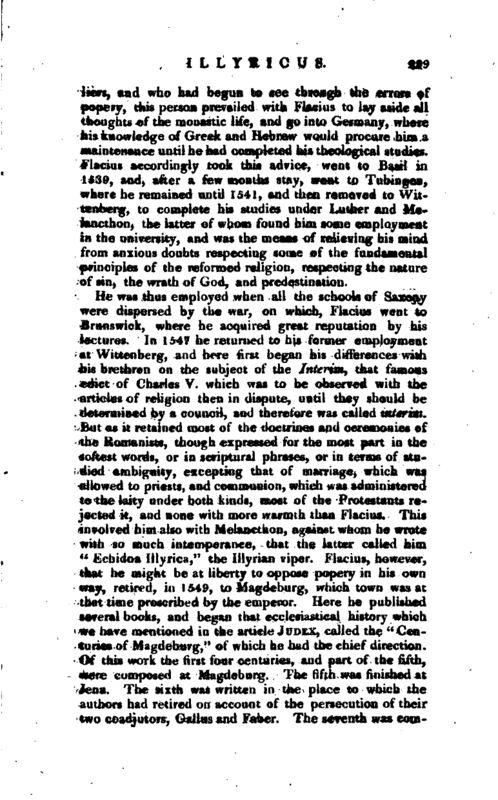 He was thus employed when all the schools of Saiony were dispersed by the war, on which, Flacius went to Brunswick, where he acquired great reputation by his lectures. In 1547 he returned to his former employment at Wittenberg, and here first began his differences with his brethren on the subject of the Interim, that famous edict of Charles V. which was to be observed with the articles of religion then in dispute, until they should be determined by a council, and therefore was called interim. 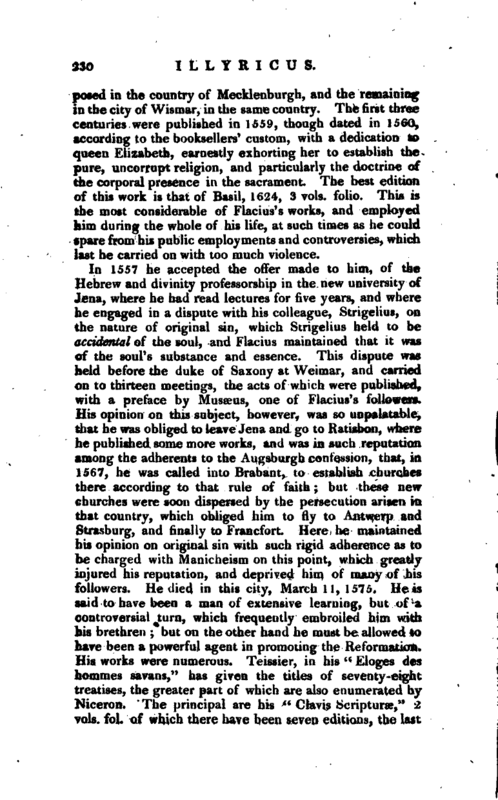 But as it retained most of the doctrines and ceremonies of the Romanists, though expressed for the most part in the softest words, or in scriptural phrases, or in terms of studied ambiguity, excepting that of marriage, which was allowed to priests, and communion, which was administered to th6 laity under both kinds, most of the Protestants rejected it, and none with more warmth than Flacius. 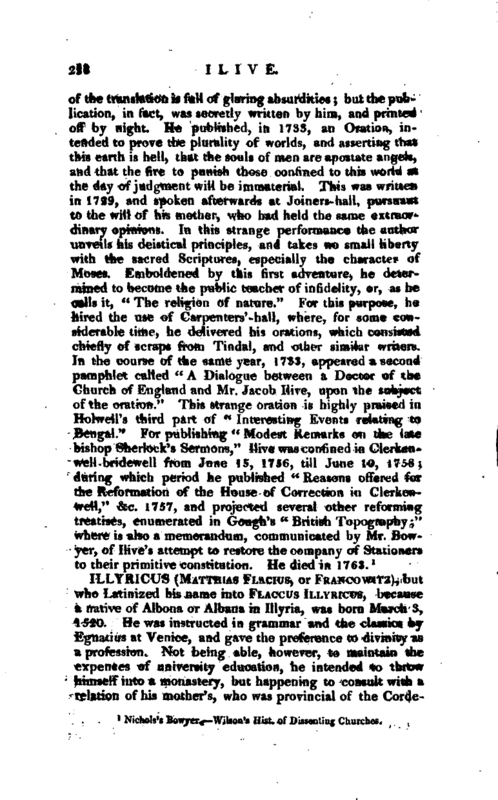 This involved him also with Melancthon, against whom he wrote with so much intemperance, that the latter called him “Echidna Illyrica,” the Illyrian viper. Flacius, however, that he might be at liberty to oppose popery in his own way, retired, in 1549, to Magdeburg, which town was at that time proscribed by the emperor. 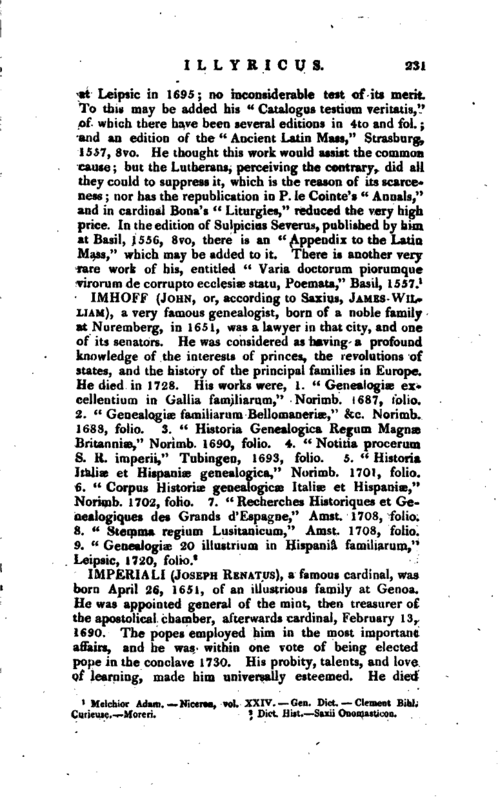 Here he published several books, and began that ecclesiastical history which we have mentioned in the article Judex, called the “Centuries of Magdeburg,” of which he had the chief direction. Of this work the first four centuries, and part of the fifth, were composed at Magdeburg. The fifth was finished at Jena. The sixth was written in the place to which the authors had retired on account of the persecution of their two coadjutors, Gallus and Faber. The seventh was | composed in the country of Mecklenburgh, and the remaining in the city of Wismar, in the same country. The first three centuries were published in 1559, though dated in 1560, according to the booksellers’ custom, with a dedication to queen Elizabeth, earnestly exhorting her to establisn the pure, uncorrupt religion, and particularly the doctrine of the corporal presence in the sacrament. The best edition of this work is that of Basil, 1624, 3 vols. folio. This is the most considerable of Flacius’s works, and employed him during the whole of his lite, at such times as he could spare from his public employments and controversies, which last he carried on with too much violence. Melchior Adam.—Nieeron, vol. XXIV.—Gen. Dict.—Clement Bibl. Curieuse.—Moreri.